In partnership with the San Francisco Public Library and the Cal Humanities War Comes Home initiative, Associated Students Inc Art Gallery will present an exhibition titled “Coming Home.” This exhibit will strive to bridge the gap between the disparate experiences of veterans and civilians by utilizing the singular power of art to express that which defies expression. By providing veterans with the opportunity to speak about the way that their experiences have impacted their perception of home, the Art Gallery will give the public unusual access to their changed perspectives. As part of War Comes Home, the Art Gallery will create a platform for education, discussion, connection, and healing. 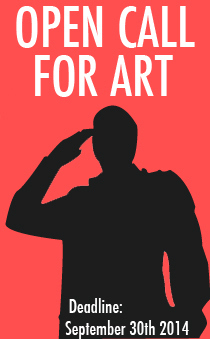 The exhibit includes an open call-for-entry for all veterans, who are invited to create an artwork, 8.5x 11 (letter size), to be hung in the Art Gallery. All mediums such as painting, poetry, text, drawing, letters, photography, and other forms are welcome. The uniformity in size will provide the audience with an element of cohesion with which to connect to the variety of voices included in the exhibit. Eligibility: Open to all veterans and relatives. Media: All mediums such as painting, poetry, text, drawing, letters, photography, and other forms. Submission deadline has been extended to October 31, 2014.